Every week until July 2nd at Intertops Casino, you can compete with other players for $30,000 in weekly prizes – up to $500 each –during the $150,000 Orient Express bonus competition. The more you play, the more points you win and the larger your weekly prize. But, thanks to weekly random draws, even occasional players can win prizes as well. Last week Intertops Casino introduced the epic new game, Three Kingdom Wars (https://casino.intertops.eu/en/slots/420-san-guo-zheng-ba). This exciting new game takes you back to ancient China and is sure to be a favorite during the competition. A powerful golden dragon is the Wild symbol. When it appears during free spins (triggered by three Scatters) it can really increase your winnings. When free spins are completed, three God Spins begin. During this feature, where Wilds and even more free games with prize multipliers can be won, you hold all the aces. Three Kingdom Wars joins hundreds of other real money online casino games from Realtime Gaming, including several new Chinese-themed games such as Shanghai Lights and Cai Hong. The new Gods of Nature (Tian Di Yuan Su) (https://casino.intertops.eu/en/slots/422-tian-di-yuan-su) will debut in June. You automatically earn frequent player points when playing online slots and table games on your desktop or laptop computers or in the mobile casino (https://casino.intertops.eu/en/instantplay) on your smartphones or tablets. As you earn points you move up a scoreboard. "It gets pretty exciting when you see your name getting near the top of the scoreboard!" said one player who often finds herself among the weekly prize winners. "Especially if you jump ahead of someone who won a bigger bonus than you last week! It's great when a few spins can make the difference between a big bonus and an even bigger bonus." 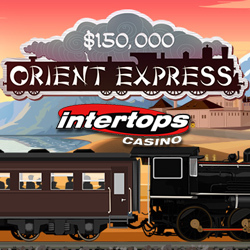 The top twenty players each week during the $150,000 Orient Express Bonus Competition are entered in a final $1000 prize draw. This is a cash prize with no wagering requirements attached.